Q. How’s the UK leg of the tour been for you so far? Q. 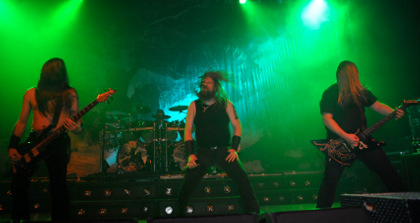 With a back catalogue as extensive as Amon Amarth is it difficult to pick a set list? A. So will you be playing a lot off the new record “twilight of a thunder god” tonight or will it be varied? A. The last time you were in the UK was while joining the unholy alliance tour with slayer how does that compare against doing your own tour? This tour now has just Entombed as support, how do you get on with them? Q. Twilight of the thunder god has been a really good album for you here and overseas with top reviews and has been placed well in the album charts. Did you feel while writing the record it was going to do well? Q. You have had a lot of guests on this album, was this something planned? A. Did you approach the record differently while writing this time around? A. You have been touring this album over a year now any plans on a break or new material? A. I noticed in a weeks time you will be playing in Australia for 3 dates, how do you feel being on the other side of the world in a short space of time? A. What’s the popularity for you like in the US at the moment? Well we wish you the best for the gig latter and hope the rest of the tour goes well!